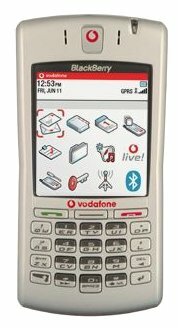 Vodafone launches the BlackBerry 7100v smartphone. Vodafone’s new BlackBerry 7100v is smaller, lighter and better. Vodafone has launched the new BlackBerry 7100v smartphone which is smaller, lighter and better than ever. The 7100v is a quad-band GSM/GPRS mobile phone weighing 120g and measuring 5.6cm wide x 11.9cm deep x 1.9cm thick. This is the smallest BlackBerry device and also smaller than the Treo 600 from PalmOne.